“These are people who had been working hard for months, non-stop for the past week. They had not gone home, they had not seen their families, they had just been working in the hospital to help people… and now they are dead. These people are friends, close friends. I have no words to express this. It is unspeakable. “The hospital, it has been my workplace and home for several months. Yes, it is just a building. But it is so much more than that. It is healthcare for Kunduz. Now it is gone. Lajos Zoltan Jecs survived October 3rd in the Medecins Sans Frontiers (MSF) hospital in Kunduz, which the U.S. bombed for well over an hour, at fifteen minute intervals. The bombing continued, despite frantic communication by the hospital staff who told U.S., NATO and Afghan officials that their hospital was under attack. Afterwards Jecs reported the indescribable horror of seeing patients burning in their intensive care unit beds. U.S. people have much to bear in mind as the Pentagon prepares to release its investigation of the attack. One consideration is that the MSF staff, as a matter of humanitarian policy, treated anyone needing care that was brought to the hospital. The U.S. may have regarded some of the patients as enemies of the U.S., but this does not justify bombing a hospital. Recent leaks of U.S. drone assassination policy, published by the online journal, The Intercept, clarify that the safety of U.S. people and the elimination of U.S. enemies have long overridden concern on Washington’s part for the preservation of other peoples’ lives, including civilians. Secondly, the U.S. Government seems unable to imagine that attacks supposedly taken in U.S. national interests can be war crimes. 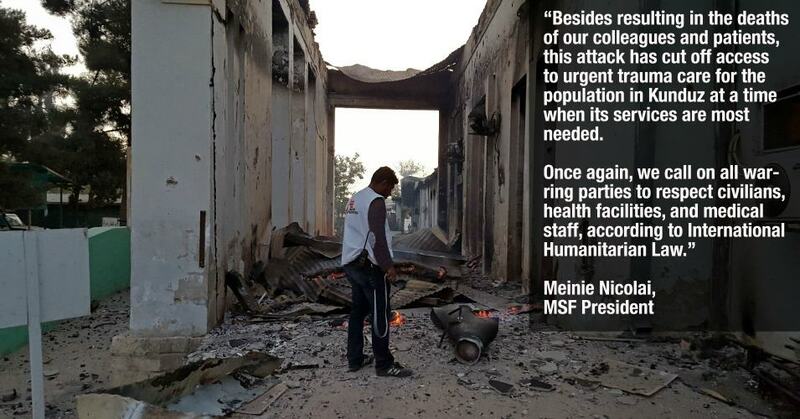 Thirdly, Medecins Sans Frontieres has issued a strong, globally-echoed call for an independent investigation into the attack. The U.S. insists on pursuing its own investigation, one element of which was an evidence-endangering attack actually crashing a tank through the burnt hospital’s shell of a first floor. The following day, AP reported that the Army’s $5 billion DCGS intelligence network, criticized by many as a boondoggle but elsewhere praised as having “saved lives” by collecting “drone footage, mapping software, human source reports, social media and eavesdropping transcripts,” was non-functional during the attack. The report was based on anonymous government leaks. Does this mean that on the day in question, the U.S. lacked a staff trained sufficiently well to consult a map, identifying the hospital they were attacking? Had the U.S. military lost its most convenient means of checking the map online? And despite these handicaps, the military went on killing anyway? It went on killing blind? We ought not to be blinded by media theater, or by habits of dismissing the doubts, and even the deaths, of countless people just like ourselves, overseas, whenever our government offers us its unsubstantiated explanations, its sincere good will, its apologies. The world can’t be blinded to attackers in a tank lunging through the gaping sockets, familiar to us from haunting pictures, of the hospital’s blackened windows and doors. The United States must allow the world to see what it has done. Ordinary people worldwide should be encouraged not to cooperate with the war makers and war profiteers who masquerade as providers of security. I think ordinary people can understand Lajos’s affection for colleagues, his pride in hard work. But it’s difficult, perhaps impossible to grasp even a fraction of the terror Lajos experienced when the U.S. airstrikes destroyed the Kunduz hospital and killed so many innocents. We must nevertheless try to imagine Lajos’s shock and terror and then imagine further how he might feel upon learning that the attackers, the killers, relied on 5 billion dollars’ worth of “intelligence” systems, which happened to be on the blink that day, and that they didn’t understand that it’s murderously wrong to bomb a hospital, at fifteen minute intervals, causing six separate blasts, even after being notified by panicked staff that their hospital was in flames and patients were burning. This entry was posted in Current News and tagged Afghanistan, Foreign Affairs, imperialism, war crimes by TD Daniell. Bookmark the permalink.